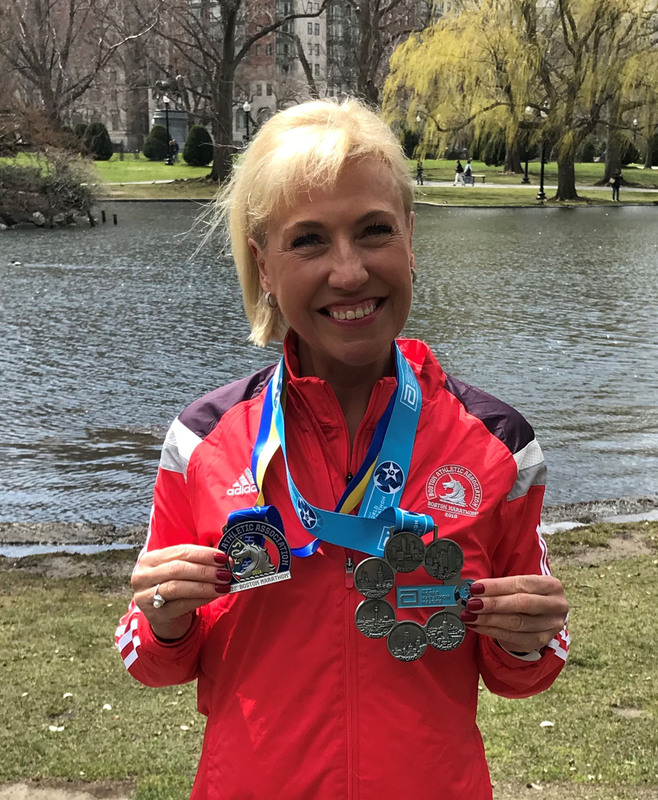 When I completed my World Marathon Majors in Boston on 16 April, Sam asked me to write a piece for the newsletter. My son, and new Roadrunner, Ben came up with some questions about the journey from the New York City Marathon in November 2015 to the final, very rainy race in Boston this Spring. Was there anyone or anything that first inspired you to attempt the 6 Majors? That’s an easy one: Aaron Chai. I still vividly remember Tom announcing during a dark and chilly pre-track briefing that Aaron had completed his 6 in November 2014. Aaron’s journey concluded in New York, a place that was on my bucket list so I wondered to myself if I could secure a place for that amazing race and in my wildest dreams target all of the other races. I’d never gone away without Ben, all of my annual leave was reserved for doing stuff with him, so this was a major departure and challenge for me: to travel on my own, find my way to the hotel, the Expo, the coaches to the start and then sight-see round New York for a week. It ended up being one of the best weeks of my life. What are the stand-out memories from the 6 races? Each one stands for something. New York (November 2015) was a week of surprises. I’d been pretty anxious about travelling alone and finding the start line, let alone the finish! I was targeting sub 3:20 and in the end did 3:15:26. For the last bit, which is undulating around and into Central Park, I think I had a look of shock on my face but this changed to absolute delight, especially when I was reunited with my ‘phone and saw that David Lewis and so many friends had been tracking my progress and sending me messages of congratulations. Back at the hotel, one of the barmen asked me my time and when I told him he said the drinks were on the house and random people started congratulating me. I ended up going out for dinner with an American couple who were also running. The next few days were spent sightseeing in beautiful sunshine and talking to people wherever I went, e.g. to a guy on the Staten Island Ferry who had seen the Twin Towers come down from his office window. It was a very memorable week. Next up was London 2016 and I had one goal at this special race: a sub-3:15 and a Championship qualifying time. I ran my heart out and finished in 3:11:18. I was over the moon and onwards to Berlin in September. Or so I thought. Just 3 weeks before Berlin I tore my right plantar fascia during an off-road race. Training had gone brilliantly until then. I was heartbroken to pull out, absolutely choked. It was a real low point for me. So I considered myself very lucky to rock up at Tokyo in February 2017, on just 3 months or so of training following the PF injury. This time I was part of the Sports Tours party, and it was a party. Race day was sunny and chilly – perfect running conditions. I tried not to think about the fact that it was 1 and 3 am back home and I was therefore running through the UK night! Somehow I finished in 3:08:23 and ended up partying with a new set of friends who I still see (and have raced with) since then. I will never ever forget how awesome that day was. Chicago had been reserved for October 2017 and that was supposed to be the next target. 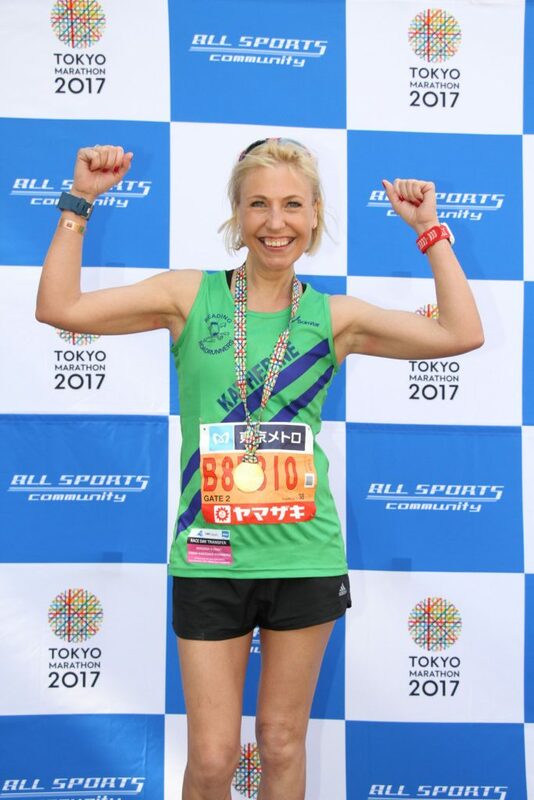 However, one of my Tokyo friends was doing Berlin and so – for someone injury prone I made the only sensible decision – to run Berlin in September and Chicago 2 weeks later. And I was extremely fortunate to do so. After Reading Half in 2017 I ended up with plantar fasciitis in my left foot and had another 3 months out. So the mission became “get round” Berlin and Chicago. When I started running again at the end of June my physio said “no speed work, no races, just miles in the legs, 3 times a week”. I ran a reserved rainy race in Berlin and got round in 3:22:53. Two weeks later Chicago was the complete opposite: in the high 20s and beautiful sunshine, it was tough running and I was thankful to cross the line in 3:23:32. One race to go!! 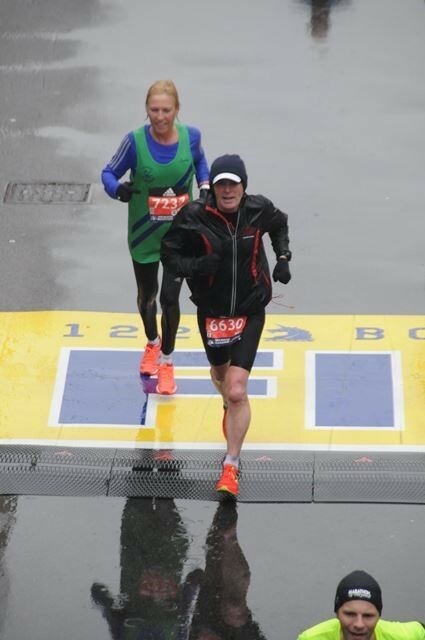 Boston, 16 April 2018, torrential rain, near-freezing temperatures and a headwind of 25 mph gusting to 40! Training had gone brilliantly and in ideal weather I thought I might come close to my Tokyo PB. In the end it became a matter of survival with warnings of dressing appropriately to avoid hyperthermia. All anyone was talking about was what kit to wear as the usual shorts and vest top would be crazy. Elites were dropping out beforehand and those that did run were way short of their target times. I was very grateful to squeeze under the London Championship qualifying time again, with 3:14:18. I sobbed when I crossed the line. I have no idea if it was the Majors achievement, the concentration I had been under for the last few hours, or the cold and wet. Fortunately Aaron Chai, the guy who had inspired me to run all these races, finished just ahead of me. He looked after me, took me to collect my long-coveted 6 star medal, but then I ended up in the medical tent to be treated for the cold. Was crossing the finish line in Boston the most satisfying, the toughest and the last? For sure. We had done our final 20 mile training run on Good Friday in pouring rain, but nothing could prepare us for the Boston conditions, including the quagmire at the race village at the start in Hopkinton. Being a point to point race, from west to east and into a biting easterly wind, there was no respite. Seeing Roadrunners, Ann McKinnon and Louise Atkinson, at the foot of Heartbreak Hill (at 20 miles) was lovely. Despite the atrocious weather there was support along the entire route – a tough but outstanding race. My advice to anyone new to running: train in all weathers! How important was the support you had in achieving this dream? The support was fabulous. Ben, you were always amazing. I remember the tear-provoking text which you sent me before I left the New York hotel, and you were always there to listen to the highs and the lows. Tony Streams – boy, has he been through the mill?! But we’ve run 3 of the races together, so we’ve had some fantastic trips and done some lovely stuff. No response to this question would be complete without mentioning David Lewis, whose updates on race progress via Facebook are second to none! Plus I am a member of an online wellbeing (but not running!) group called On the Wagon. I’ve made a stack of friends there who made the bad days bearable and celebrated the highs. Where is your Majors medal now? It’s still hanging on my bedroom door. It’s pretty much the first thing I see when I wake up which is really nice. It’s also ready to pop in my bag and show to colleagues and clients etc. who have all been interested in my progress and want to hear about Boston in particular. The plan is to have it framed with the 6 that made up the journey. Do you have plans to run any of the Majors again, other than London? Well, you know I want to take you, Ben, to NYC for the 2020 marathon when you’re old enough to be bought a beer in the US. I’m hoping that’s the time when you also get the bug for running 26.2! I’d also like to go back and do the time I know I’m capable of in Berlin. And I might go back to Tokyo and share that race with Tony, as he looks to finish the 6 majors as well. So no, not really!! I hope to enjoy some Club Championship races in May and June because I gave these up in a bid not to do too much. In the autumn, it’s back to some more overseas marathons, all being well. Posted in April-June 18, Presentations-Articles, Race Reports, Roadrunners18.